One of the earliest well-known, anamorphic works is a painting by Hans Holbein the Younger "The Ambassadors" (1533). In the foreground shows a human skull, which can be seen only at a certain angle. Anamorphosis techniques are widely used since the 16th century in ceiling paintings of the premises for creating the illusion of leaving up the space above the heads of people. 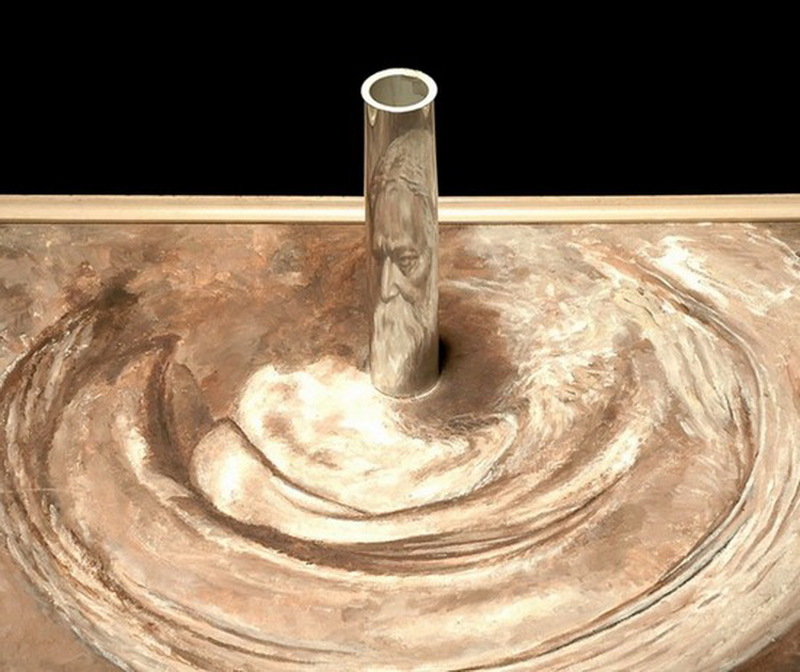 Anamorphosis ideas were further developed with the advent of digital photography and computer modeling. French artist Bernard Pras creates installations of famous paintings and portraits of celebrities, using a variety of subjects. Shapeless heaps of things that are scattered in large halls, transformed into artworks when the astonished spectators turn out in the "right place." 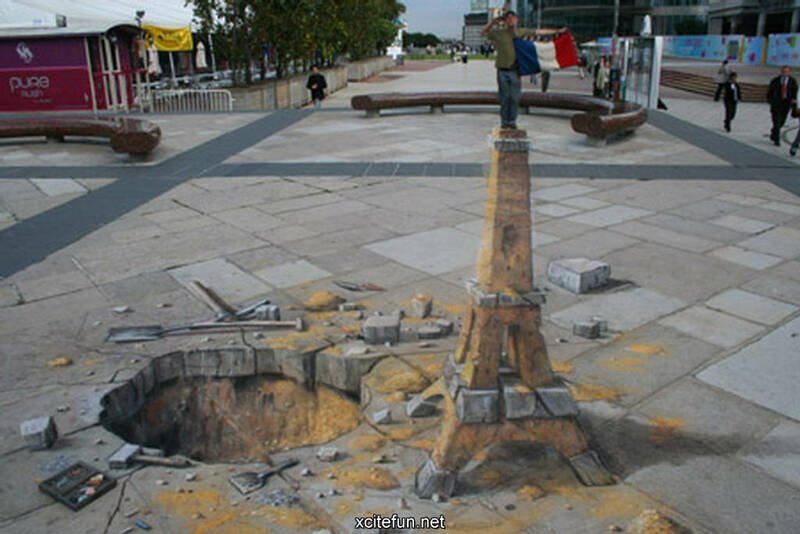 English artist Julian Beever creates a three-dimensional chalk drawings on the sidewalks of cities around the world. 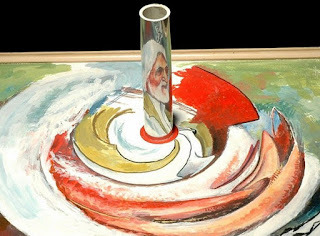 Abstract paintings by Indian Awtar Singh Virdi become recognizable portraits that can be seen only from one angle in a cylindrical mirror, placed in a specific location of the artwork. 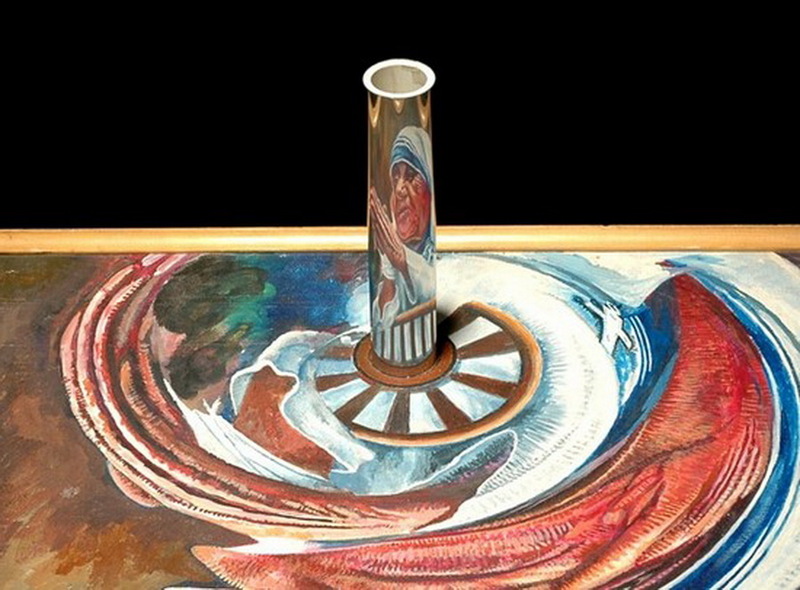 ANAMORPHOSIS IN GALLERIES AND ON THE TABLE. 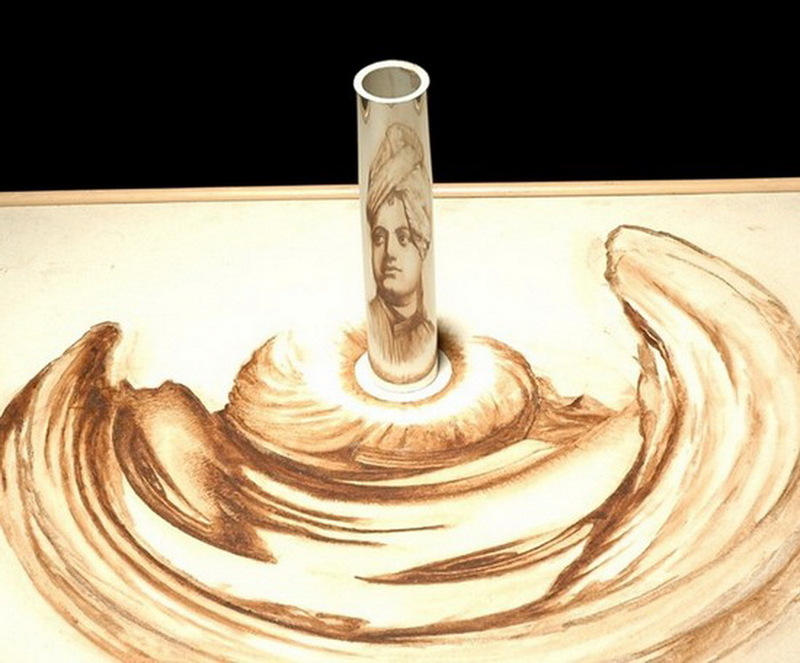 In 2012, Guangzhou (China) was successfully held exhibition of anamorphic paintings by 15 South Korean artists "2012 Magic Art Special Exhibition". 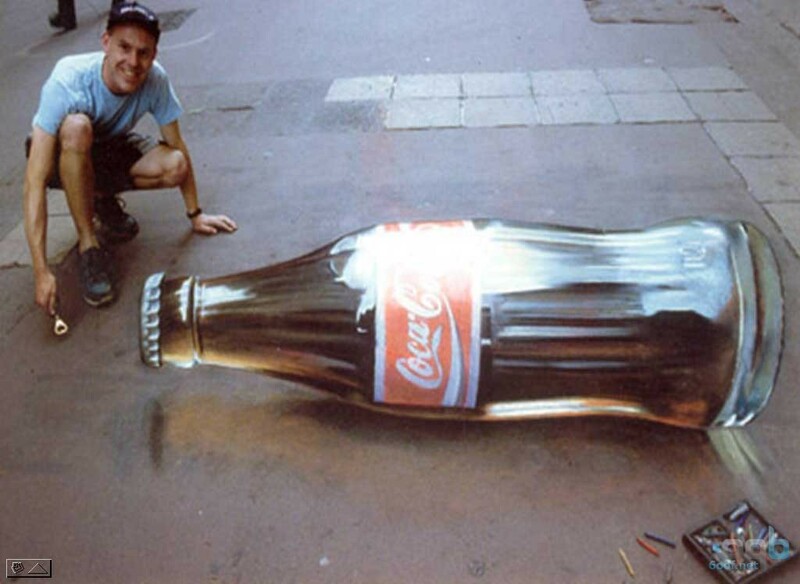 Painted shadows and certain points of view create the impression 3D paintings and audience participation in the formation of compositions created an additional effect of realism. 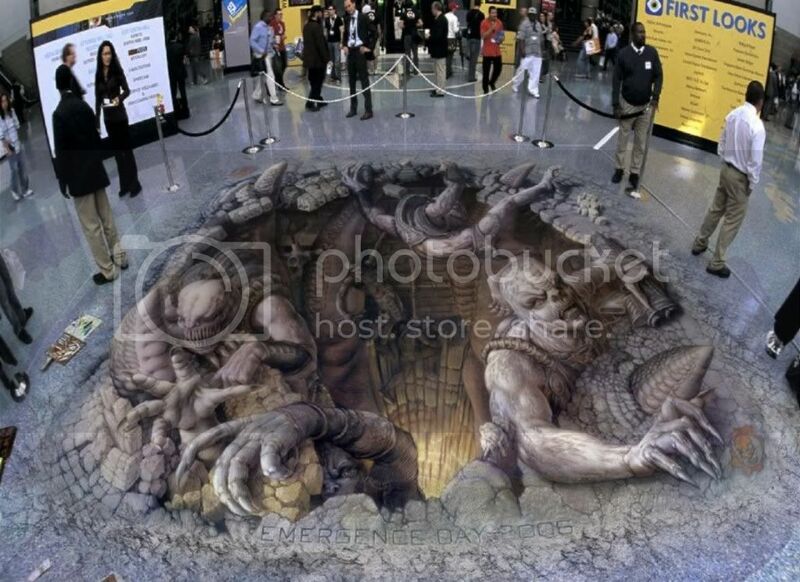 "2012 Magic Art Special Exhibition"
Dutch artist Ramon Bruin draws with pencil on sheets of A4 paper. The author adds to his drawings such items, through which the audience is difficult understand where the real world ends and fantasy world begins. 1. Free Press. 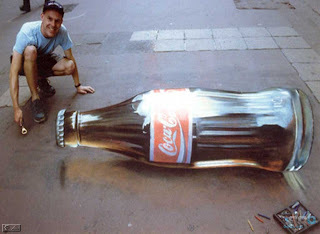 That's creative! 3. You Tube. Hans Holbein the Younger. The Ambassadors. 4. Original anamorphic image of Rubik's Cube - download. 5. Original anamorphic image of a coil of electrical tape - download. nuno be very talented in order to draw so beautifully, is there really no such a master capable of translating more complex ideas? Wow. 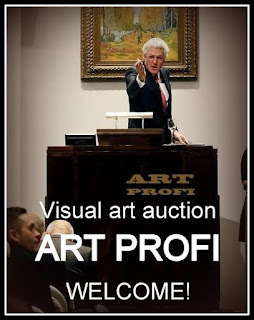 I did not even suspect that in modern art there is a similar genre. It's great. 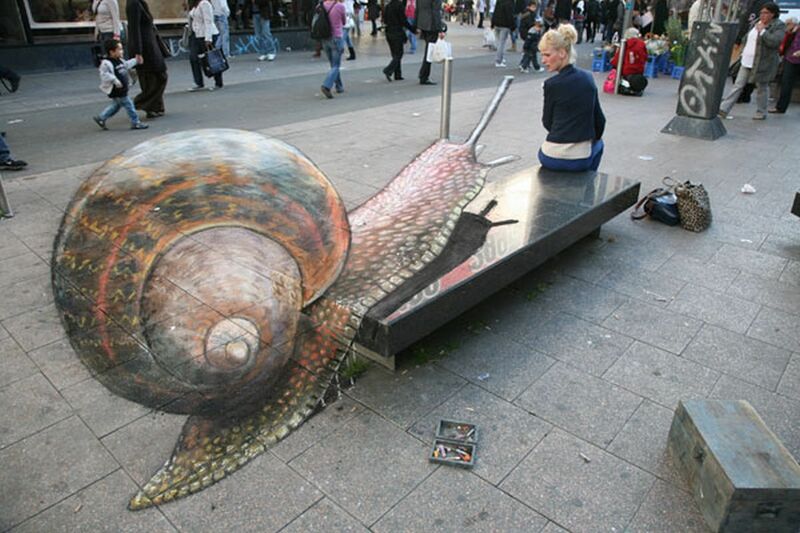 It is pleasant to realize that art still develops, and does not stand still.